In this modern era, we have the freedom to wear whatever we wish to. But this doesn't mean you can wear a pair of red clogs with green jeans and think you can create a style statement. The classy blue jeans never go out of style. Their ease of wear makes them popular amongst many men to wear. Their washed out color and slim fitting make them a great pair of jeans to wear during the day. 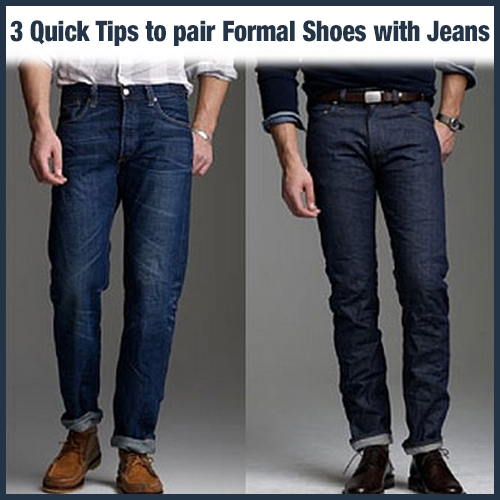 Quick Tip: You can wear them with a pair of formal shoes by rolling them from bottom to show a little bit of ankle. The shoes are the best part. Before picking a pair of shoes with blue jeans make sure that you know what color you are wearing. It is an important part of your look. Try the pair of brown bullock shoes and mix it up with your blue jeans but this doesn't mean that you can mix them a lot. The added detail of high insole in this shoe makes a great piece of a slot in your footwear collection. But in case you want to keep your style little more classy then you can try loafers from Altolia for a chic look. Raw Denim are one of the stylish and versatile pieces of denim anyone can ever own because the darker color gives a casual look. Their slimmer fit and darker color make them a versatile piece. The best thing about this denim is you can wear every color you want to. But make sure that you avoid shoes in the same color because this will completely throw off your outfit. Choose colors like brown, black or burgundy for a detailed and colorful look. Add a little bit of color in your dressing by wearing a pair of brown casual canvas shoes. This color will add a different look without being overboard. The best thing about wearing black jeans is you can get away with them easily like trousers which is a win-win situation – their versatility appearance and color make them look great and without any second thoughts, they are perfect to be categorized as a classic pair. Quick Tip:Add a black sports jacket and black Chelsea boots for a casual look that takes just a few seconds to put together. The world is your oyster when it comes to team your shoes with black jeans. You can always go for black-on-black because this combination never goes out of fashion. Try not to be over-excited with color, eventually, you want to look presentable and stylish. Team your black jeans with a pair of camel brown suede leather boots. This pair from Altolia will give you a formal element by keeping you comfortable and practical. If you wish to try something different then loafers are always in and try not to wear socks. Lastly, on that note, we can say that jeans are a wardrobe staple so style them elegantly with formal shoes without any hesitation.